Washington, D.C. – In the past several years, credit card interest rates and debt have risen substantially, increasing consumer costs by tens of billions of dollars annually. 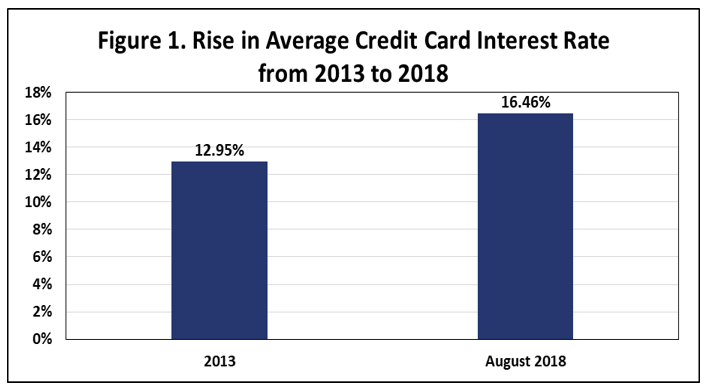 Most striking, according to Federal Reserve Board data, the assessed interest rate on credit card accounts rose fairly steadily from 12.95% in 2013 to 16.46% in August 2018, an increase of 27%. The recent credit card interest rate is the highest in this century. “As interest rates have risen, financing holiday purchases with credit cards has grown more expensive,” noted Steve Brobeck, a senior fellow at the Consumer Federation of America (CFA). “Consumers with high credit card debt levels should be particularly cautious about increasing their debt during the holiday season,” he added. Credit card debt, as well as interest rates, has also increased significantly in the past several years. According to Federal Reserve Board data, outstanding revolving credit rose from $855.6 billion in 2013 to $1,041.4 billion in August 2018, an increase of 22%. Consumers are not paying interest on a portion of this debt since it includes new balances that are paid off at the end of the month. And a small portion of the outstanding credit represents debt from overdraft loans. Yet, in 2018 consumers will still be paying tens of billions of dollars more in credit card interest than they did in 2013. The credit card interest rate hike is significantly higher than the rate increase for other types of consumer credit, as the Federal Reserve data below indicates. “Issuers should explain why credit card rates have risen much more rapidly than other consumer loan rates,” said CFA’s Brobeck. “The increase in the prime rate by two percentage points in the same period does not explain all of the 3.5 percentage point hike in card rates,” he added. Many credit card rates are variable and linked to the prime rate. There are recent signs that some consumers are having greater difficulty making credit card payments though credit card delinquency and default rates remain low relative to these rates since the 1990s. For the largest 100 banks, these rates are well below peak rates during the Great Recession – for delinquency rates, 2.48% this past August compared to 6.64% in the second quarter of 2009, and for charge-off rates, 3.72% in August compared to 10.68% in the fourth quarter of 2009. But for all other banks, the rates were at Great Recession levels – for delinquency rates, 6.14% in August compared to 5.61% in the fourth quarter of 2008, and for charge-off rates, 7.57% in August compared to 8.36% in the first quarter of 2010. “The relatively high credit card debt and interest rate levels may not be affordable for many consumers in the event of an economic downturn,” noted CFA’s Brobeck. Before the Great Recession, credit card payment problems had been steadily on the rise: Delinquency rates at commercial banks increased from 3.54% in the fourth quarter of 2005 to 6.77% in the second quarter of 2009, while charge-off rates at these banks rose from 3.17% in the first quarter of 2006 to 10.54% in the fourth quarter of 2009. Federal Reserve Board, Consumer Credit G.19 release (November 7, 2018). The assessed interest rate is the one charged on outstanding balances, not the one, also reported, for all credit card accounts. St. Louis Federal Reserve Bank, FRED, historic data on assessed credit card rates charged by commercial banks (https://fred.stlouisfed.org/series/TERMCBCCINTNS). Federal Reserve Board, G. 19 release, loc. cit. The August figure was used to be comparable to the latest reported interest rate figure. The November release reported August figures for both statistics but only the September figure for outstanding credit (which at $1041.1, was virtually identical to the August figure). For a discussion of these issues, see: Consumer Financial Protection Bureau, The Consumer Credit Card Market 2017, chapter 2. No federal agency reports the percentage of total outstanding revolving credit that incur interest charges. However, using bank reports of credit card interest collected, it is possible to estimate this percentage for credit cards. The research organization R.K. Hammer estimated credit card interest income at $63.4 billion in 2016, which given the average assessed interest rate that year, suggests that about one-half of outstanding revolving credit incurred interest charges. 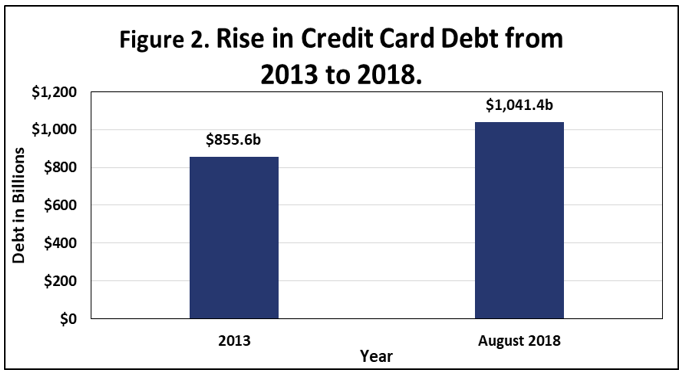 Using this 50 percent figure, estimated credit card interest charges rose from about $55 billion in 2013 to a projected $80 billion in 2018.
 Credit card delinquency rates indicate the percentage of loans for which payments, typically two consecutive ones, have been missed. Credit card charge-off rates indicate the total amount of charges in default, typically at least 180 days, as a percentage of total charges. Historic delinquency and charge-off rates on credit cards for all commercial banks, for the 100 largest banks, and for all smaller banks are reported by FRED (Federal Reserve Economic Data) maintained by the St. Louis Federal Reserve Bank.